The development and effective marketing of dog car seats offer a sense of security for pet owners. But just how safe are the current dog car seat options? Surprisingly, they’re not nearly as safe as we are led to believe and certainly not as safe as they should be. What Makes a “Safe” Dog Car Seat? Because of how convenient and good looking a pet car seat may look to pet owners, more companies have started developing and selling these products. There are pretty much no laws governing what a company can say about their dog car seat product, and plenty of well-rated best car seats for dogs that have become popular among pet owners. You'll notice an abundance of good dog car seat reviews out there, but the problem is that while they may be comfortable for the dog, their purpose is safety and protection of your pet. And it's unlikely that pet owners leaving those reviews have actually tested those seats in a situation like a car accident and collision. So here's what you should know. How Safe Is Your Dog Car Seat? If you're allowing your pet to simply sit in the car during travel unrestrained, you're being an irresponsible pet owner and driver, making a huge safety mistake. After all, car seat belts exist for a reason, and the same reason applies to dogs. In some places, you will even get a large fine if your dog is unrestrained. Protecting your pet in a car is essential, and there are several ways you can do that. Before we look at specific dog car seat options and their safety, it’s important to distinguish between the various pet restraints for cars and “seats” that are being sold. I'm not going to be discussing car harnesses or seat belts in this article. Instead, we'll focus on dog car seats which are frequently lumped together with dog carriers and dog booster seats, but the structure and purpose of these three products are drastically different. Here's how they differ. Pet carriers are designed for transport and may be soft sided, crate-like, or cage-like in appearance. 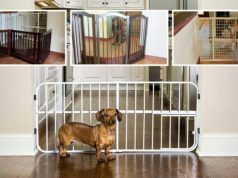 “Car-friendly” dog carriers are generally not much different than any other carrier choice, although there are some designs that make a travel-friendly dog crate. The prime purpose of dog carriers is to keep your dog confined during travel. They also make it easier for pet owners to transport the pet in between car trips. Pet carriers feature no formfitting restraints, allow for movement within the confines of the carrier, and generally have a carrying handle but no built-in anchor system. Unlike pet carriers, booster seats are open-design rectangular seats with raised sides. A booster seat is most often confused with a dog car seat, but there are several differences. The purpose of doggy booster seats is to minimally confine your dog in the car while providing the pet with a better “view” by elevating them off the seat. Booster seats have anchoring systems that work with seatbelts to keep the booster seat in place. Most also feature an anchor point inside the seat where your dog’s leash or harness can attach. This attachment point provides little in terms of safety, however. Car seats for dogs are designed for the same purpose as child safety car seats – to keep your dog safely restrained in the car and protected in the event of a collision. Unlike booster seats, they prioritize restraint over better viewing angle for the dog. Canine car seats have anchoring systems that work with dog seat-belts to secure them to the seat of the car. They also feature a more complex restraint system than the booster seat for keeping your dog secured inside the seat. By definition and design, a dog car seat is a safer option than pet carriers or booster seats, but as you will see later in this article, they still leave much to be desired. A dog car seat is identical to a child car seat in its intended purpose. 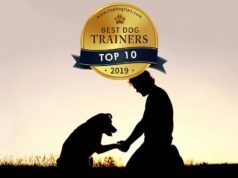 Independent research and testing, however, have clearly shown that the outcome of their use with dogs is much less than favorable, and not what a pet owner would've expected. This poses a question: why is there such a big difference in the failure and success rate of a child car seat versus dog car seat? Cars and seats (child safety seats) are both designed for human use. They fit the human anatomy, support a person's natural posture, and restraints effectively limit movement. Many years of research and studying have gone into designing these seats to fit a person and perfect how much protection they provide during a car crash. When it comes to dogs, though, no car seat or car barrier for dogs on the market perfectly fits the canine anatomy, supports the natural canine posture, or restrains movement enough to provide safety. 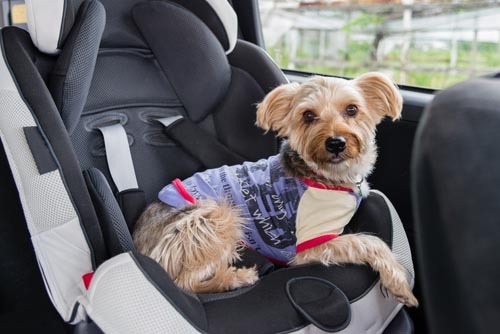 Every dog car seat available on the market today have been designed based on human child car safety seat, which has nothing to do with an animal like a dog. If the human car seat structure doesn’t work, what does make for a safe dog car seat and how would should it protect a dog in the event of a car crash? A multi-point restraint system design to fit the canine anatomy and limit movement completely for the dog. Metal tether attachments to prevent breakage of restraints in the event of a car accident and collision. Child safety seat type anchors to hold the dog car seat in place on the car’s back seat. In the event of a collision, the car seat should allow for minimal movement, have minimal rotation, and keep the head from colliding with the seat in front. These things are easy enough to do with a human child car seat and can even be replicated with a dog car harness. Unfortunately, as of early 2018, they have not been successfully applied to any dog car seat available on the market. Like any other “safety” car seat, a dog car seat should be able to endure a collision and maintain it’s integrity while keeping your dog safe. Certain features increase the durability of any car seat – side-impact protection, metal latches, and energy absorbing padding. A good indication of how confident a manufacturer is in the durability of their dog car seat is the length of their warranty or guarantee. A company that is confident in their product will offer a lifetime guarantee. Some companies also go so far as to offer a collision replacement policy that will replace your dog car seat should you experience a collision. Now that you know what makes the best dog car seat that's safe for your pet, what options are available and is there anything you can trust? I've looked at literally every single dog car seat option available for purchase online. The sad truth is that there is just one dog car seat that comes somewhat close to the design requirements that would protect (yet still falls short). It's the PupSaver pet car seat. Before I get into this, let me be clear about a few things: I have not been in touch with this company and I am not getting paid by the company. I am also not advocating for or against the use of this dog car seat, and encourage you to draw your own conclusions. The point here is that this pet seat simply comes closest to the pet car travel safety requirements posed by Center for Pet Safety, it's been crash-tested, but still doesn't meet all the requirements. The PupSaver dog car seat can be purchased online and it's one of the most expensive dog car seats out there. Currently it is available in three models for different size dogs: the PupSaver Petite for dogs up to 10 lbs., the Original PupSaver for dogs up to 30 lbs., and the PupSaver45 for dogs up to 45 lbs. The 10 lb. and under model of the PupSaver costs $154.95. The 35 lb. and under model of the PupSaver costs $159.95. The 45 lb. and under model of the PupSaver costs $170.95. Each of the three PupSaver models is rear-facing dog car seat designs with 5-point safety harnesses for pets. One of the biggest selling points of this specific dog car seat is that it provides head and neck support that is not available in any other car safety harnesses. The final selling point of the PupSaver dog car seat, of course, is its “Crash Tested” label. So let's talk about “Crash Tested” label of this PupSaver dog car seat, what this means and whether it's something that you should consider as a good selling point. We need to make an important distinction here first. There were two well-known dog car seat crash safety tests done for PupSaver. One was done by the company themselves in 2014, and another test done by an independent team in 2015. Let's start with the latter. In October 2015, the Center for Pet Safety conducted a pet seat safety pilot study to test the crash performance of a number of different car seats for dogs, dog car booster seats, and car pet carriers. PupSaver was one of those seats tested. The PupSaver rotated upon impact and the pet seat rolled onto its side. One anchor strap released due to a plastic buckle failure and the product sustained some tearing. The 30-lb. test dog remained connected via the collar and PupSaver Tether system. According to this CPS dog car seat testing, the PupSaver had multiple failure points. In their final study wrap-up (PDF), the CPS team have concluded that while this specific dog car seat was effective at containing the dog and preventing driver distraction, it was not effective at protecting the dog in the event of a collision. These claims were based on the company's own 2014 crash test study. However, while PupSaver dog car seat safety testing found the seat could safely contain a 25 lb. crash test dog during crash testing, they went on to recommend the seat for dogs of 30 lb. When this testing was done with a crash test dog of 30 lb., the results were questionable, especially when you compare it with the 2015 study and how the team approached testing there. Also, when compared, the company does not mention if there were any points of failure during testing; rather, they simply state that the dog was successfully “contained,” which obviously does not reveal enough information. Ultimately, when comparing the 2014 and 2015 studies, their results and – most importantly – things that the team were looking to test, something somewhere isn’t adding up here. Since the 2015 independent testing of the PupSaver dog car seat done by the Center of Pet Safety was performed, the PupSaver company has expanded their line of products to include the Original PupSaver (also referred to as the PupSaver 25), the PupSaver Petite, and the PupSaver 45. As of June 24th, PupSaver claims that their new car seats for dogs have also passed crash testing. If you’re like me, you will take that claim with a grain of salt, at least until the Center for Pet Safety performs their own independent testing on these too for less biased results. If you managed to follow the squirrely confusion of the last few paragraphs, you may still be asking yourself: what in the world does it all mean, and what do I make out of all this? What safe dog car seat should I buy, and whom do I trust? Good question. In short (and in the opinion of this dog owner), what it all means is that there are almost no well-tested safe dog car seat options that should be considered as the absolute best car seats for dogs. There is one option, the PupSuver dog car seat, that comes closest to being a safe pet safety seat for car travel. However, there are also safety testing discrepancies with the PupSaver dog car seat. For me personally, that’s enough to pass up on this or any other dog car seats, and wait for more improvements to these products and further tests. This is especially true when there are multiple successfully crash tested dog car safety harnesses on the market which have been proven to protect your pet better than a doggy car seat during collision. So, with all the above considered, what needs to happen for dog car seats to become safe and a reasonable choice for pet owners to use during car travel? A much larger investment in crash safety testing, more product development research to develop safer designs and stricter laws and guidelines for manufacturing products that are made for safety and protection of pets would be a start. This may be an exercise in futility, however, simply due to the fact that dogs don’t sit “in” seats and their bodies are certainly not designed for car seat restraint systems. Sadly, I'm not an expert and cannot shed more light on this than I already have above. It’s tempting to be lured in by the idea of a dog car seat based on what we know about child safety seats and through the biased marketing efforts of canine car seat companies. The truth is, though, that safety testing data from independent sources show that a crash-tested car restraint is a much wiser investment in your dog’s safety than a dog car seat.